This seated position of Ashtanga Primary Series works with the internal rotation of the hip and knee as well as deep plantar flexion of the foot. Many sensitivities can arise here as we rarely put ourselves into this type of alignment in daily life, but it is important as a counter to the many positions of external rotation we do in our yoga practice. To identify your body’s particular resistances, access one movement at a time. You will feel it most intensely wherever you are tightest. From a seated position, begin by flexing the knee in the parallel, closing the joint as much as possible, heel to sit bone. Then rock yourself towards your extended leg, lifting the pelvis on the bent knee side to allow space to drop the thigh across the midline of the body, finding adduction and internal rotation, and tuck the foot back along side the hip, toes pointed behind you. You may feel strain in the ankle here if you have reached the limit of your plantar flexion. If this is the case, you an put a rolled towel under the ankle to lessen the pressure and stretch. Draw the bent, internally rotated leg in to touch the extended leg, knees together. There is a tendency here to have scooted the lifted side of the pelvis back in space, so check to see that the pelvis is squared off, knees aligned with each other. If you are already feeling resistance in the hip or knee, you may want to stay here, keeping the hand to the floor for support. If not, begin to send the lifted sit bone back down into the floor to ground. This will deepen the rotation at the hip and the knee so go slowly and honor your limit. If you are able to anchor through both sit bones, fold forward. Tippyness is the point here! The tipsiness of the posture directs your awareness to where you need to work. Internally rotate the extended leg to help send energy towards the center. Hug the inner thighs together, draw the femur bones into the hip sockets. In the fold, draw the bent leg and the same side ribcage towards each other. The urge might be to push the knee into the floor, but play with this lifting energy allowing the thigh and torso to hug together. Then, finally, let go of what you don’t need (shoulders tense up, anyone?) and relax as much as possible, without falling over! If you struggle with this posture, be patient. For some, it can take many years to find ease and comfort in Tiriang Mukha Ekapada Paschimotanasana. The key to to identify your resistances as they arise and address them mindfully and thoroughly. This is an iceberg posture – most of the effort and exploration is happening below the surface, with subtle changes. Stay present, do the work. Warrior I, otherwise known as Virabhadrasana A, is one of the most basic poses in the practice. It is also, however, deceptively simple. When performed correctly, Warrior I should cause the thighs to burn, the heart rate to accelerate, and the breath to become heavy. You should feel a sense of heat rising throughout the entire body as you cultivate both mental and physical strength. When practiced mindfully with proper alignment and adequate effort, the whole lesson of the journey of yoga can be found right there in Warrior I. In Indian mythology, Virabhadra is a spiritual warrior created from a lock of Shivas hair. Shiva sends Virabhadra down to Earth to act as a warrior of peace in the world. When Shiva releases this lock of hair, dropping our warrior down to Earth, Virabhadra lands, at the ready in Warrior I. This posture and the story behind it represents the brave heart of the Yogi. As you begin to practice, you gain access to the energy of Virabhadra, and as such, gain the spiritual strength to go out into the world as a force of healing energy and strength. To practice your strongest Warrior I, begin in mountain pose – Samasthiti. Hug the belly in toward the spine and begin to lift your energy up along the midline. Cultivate strength in your mountain pose and then step back with the left foot. You want about the distance of one of your own legs between your feet. Place the heal of your back foot down onto the mat so that the toes come out to a 45-degree angle. Check to be sure that the heal of your front foot is in line with the arch of your back foot, then press down with the back leg to seal the outside edge of the foot against the mat. Be sure to keep your pelvis in a neutral position, oriented forward toward the top of your mat. From here, pull femur-head of your front leg into your hip socket as you bend the front knee. Be sure that you keep the belly hugging in toward the spine, and then reach the fingertips up toward the ceiling, palms touching. At the same time, lift your gaze. The whole body strong, every muscle working. Hold here for several rounds of deep, continuous breath, then step back to Samasthiti. When you’re ready, mode to the other side. 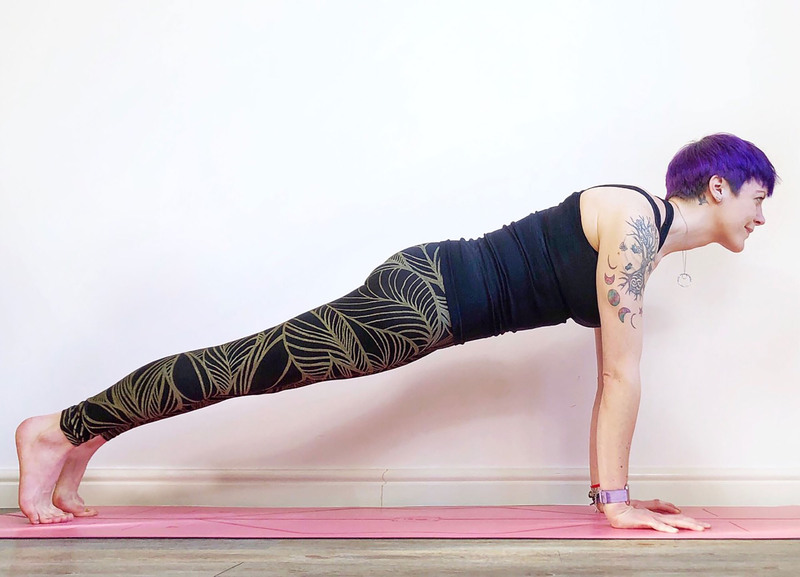 Note: The alignment cues and expertise offered in this blog post come straight from Kino’s breakdown of this pose on OMstars series, The Encyclopedia of Yoga. 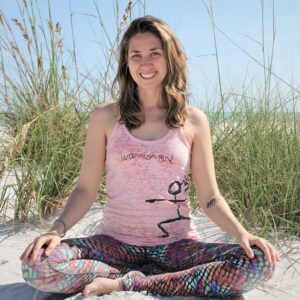 Alex Wilson is a writer, yoga teacher, and the content manager at OMstars – The Yoga Network.